H.E. 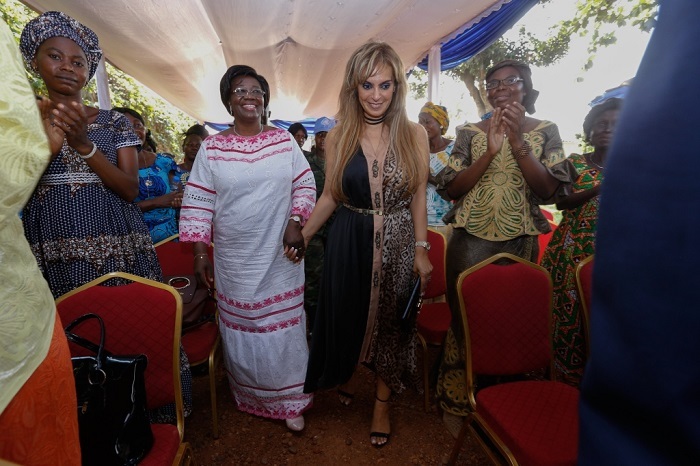 MADAM BRIGITTE TOUADERA, The First Lady of Central African Republic and Dr. Rasha Kelej, CEO of Merck Foundation & President, Merck More Than a Mother during their special meeting with more than 100 infertile women. H.E. MADAM BRIGITTE TOUADERA, The First Lady of Central African Republic, Dr. Rasha Kelej, CEO of Merck Foundation & President, Merck More Than a Mother and Dr Pierre Somse, Minister of Health and Population C.A.R. addressing the group of infertile women. Merck Foundation underscored their partnership with the First Lady and ministry of Health of Central African Republic - C.A.R. Merck Foundation awards the First Lady of Central African Republic to acknowledge her efforts to empower infertile women as the ambassador for Merck More than a Mother. Merck Foundation CEO, Dr. Rasha Kelej together with H.E. MADAM BRIGITTE TOUADERA, The First Lady of Central African Republic – C.A.R. & Merck more than a Mother Ambassador, conducted a special meeting with more than 100 infertile women who have been enrolled in the “Empowering Berna” to establish small businesses for them. Merck Foundation has discussed with the H.E. President of Central African Republic, H.E. FAUSTIN-ARCHANGE TOUADÉRA, their long-term partnership to build healthcare capacity in the country which he strongly endorsed and supported. Merck Foundation also approved a list of candidates to be enrolled in their one and two-year oncology fellowship program as a contribution to improve cancer care in the country. Moreover, they will also provide on-line diabetes diplomas in French for Doctors from C.A.R as well as cardiovascular preventive medicines fellowship in Asia. The Merck Oncology Fellowship Program, a key initiative of long-term Merck Cancer Access Program, focuses on building additional capacity through medical education and training. The lack of financial means is not the only challenge in Africa and developing countries, but a scarcity of trained health care personnel capable the prevention, early diagnosis and management of cancer at all levels of the health care systems is even a bigger challenge.